Liver cancer, i.e. hepatic cancer or hepatocellular carcinoma, can be cured, if the tumor is small and operable, or if the patient is in a condition that allows a liver transplantation. Unfortunately in most cases, neither surgery or transplantation is possible, or the disease returns after the surgery. If the disease is only present in the liver, i.e. it has not metastasised, the treatment may involve local modes of therapy, such as thermal ablation or chemoembolisation. In thermal ablation, the cancer tissue is destroyed by heating it with radiant energy, for example. In chemoembolisation, small radioactive particles and/or particles that block the stream of blood to the tumor are injected into the tumor area via artery. Stereotactic radiotherapy is a possible option if the patient has been diagnosed with a non-metastatic liver cancer that is untreatable with surgery or the methods described above due to the condition of the patient or the status of the the liver, for example. Stereotactic radiotherapy is still used relatively rarely in the treatment of liver cancer. Stereotactic radiotherapy means that the radiation dose is administered to the tumor with the precision of a millimetre. Pinpoint accuracy enables administering a larger dose of radiation, which makes the treatment more effective. When it comes to radiotherapy for liver cancer, the cooperation between physicians and medical physicists, careful planning of the treatment and understanding the overall situation together play a key role. Multidisciplinary collaboration enables an individual and as effective treatment plan as possible with an aim to control any possible side effect. Patients in good condition can withstand larger doses of radiation, whereas elderly and fragile patients require as effective treatment as possible that also takes their condition into account. In addition, it is vital to target the treatment into the tumor with pinpoint accuracy in order to minimise the damage to healthy radiosensitive liver tissue. 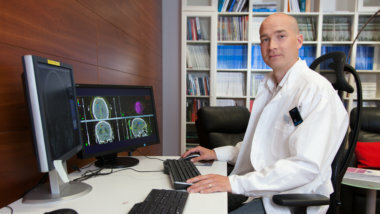 Stereotactic radiotherapy is administered over the course of 1 to 14 days, depending on the size of the tumor and the individual treatment plan. In most cases, radiotherapy is an effective mode of treating liver cancer. Sometimes, the treated tumor may even be eradicated. Unfortunately, radiotherapy does not cure liver cancer altogether in most cases, and a risk of recurrence exists. However, liver cancer can be treated with chemotherapy after radiotherapy. Immediate and comprehensive treatment of liver cancer with both radiotherapy and chemotherapy can improve the patient’s prognosis and life expectancy. Liver cancer specialists at Docrates Cancer Center are Medical Oncology specialist Tuomo Alanko, Radiotherapy and Oncology specialist Maigo Riener and Medical Physicist Timo Kiljunen.